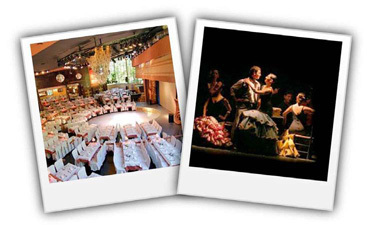 We propose you to enjoy a good dinner animated by a Spanish ballet and flamenco show at the Florida Park club (www.floridapark.net), one of the most traditional in Madrid and located at the centric Parque del Retiro. The show will be performed by the Ballet Español Besos del Sur; it will be a good opportunity to admire an elegant and pleasant show that is quite representative of one of the most typical Spanish folklores. Avenida Menéndez Pelayo (in front of Calle Ibiza), entering through the Parque del Retiro entrance. Metro: Ibiza station (L9). Instructions from the Palacio de Congresos: take line 10 direction Hospital Reina Sofía. At the first stop (Plaza de Castilla) transfer to line 9, direction Arganda del Rey. Get off at Ibiza station and walk 100 m, towards the Parque del Retiro. Total estimated time: 20 mins. Taxi: share a taxi and you will get there in a few minutes at a low cost. Estimated duration: 15 mins. We recommend that you arrive a bit early to have some time to take a walk around the Parque del Retiro, the most emblematic urban park of Madrid. It’s worth it! Colloquium attendees: 40€, duly accredited and previously registered for this event. Accompanying persons: access with the accompanying pass or with a ticket for the event, which can be purchased below for 60€.